On September 9 2014, Professor Raymond Tanter was on Russian TV. 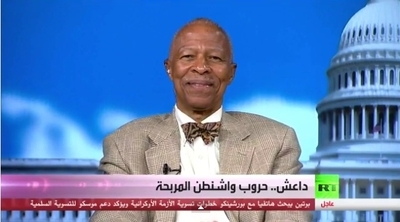 The program was for 30 minutes; Raymond Tanter was in Washington and debated the host, Salam Mosafir, who was in Moscow. Mosafir made several allegations of U.S. policy in the Middle East: Washington created the Islamic State of Iraq and Syria (ISIS) to justify using force again in Iraq and extending military action into Syria; the emerging American strategy is to use ISIS as justification to build a coalition that would divide the Arab world; and Washington needed the threat of war to have a reason for increasing defense spending for an ailing American economy in need of a stimulus. First, Tanter replied that ISIS was not an American creation: It came out of al Qaeda of Iraq and disgruntled remnants of Saddam Hussein's armed forces, as well as Sunni tribes that had been sidelined by the government of Nouri Al Maliki of Iraq. Second, the emerging American strategy is to use ISIS as justification to build a regional coalition not to divide the Arab world but to bring it together around a common agenda. Likewise, Washington wanted the new government in Baghdad to be more inclusive so Kurds, Iraqi Sunni and Iraqi Shia might work for a common cause. Third, in 2013, the United States spent 4.4 percent of its GDP on defense. And although war spending has probably stimulated the U.S. economy to a small degree, the extra income has been partially offset by negative consequences of increased deficits and debt used to finance the wars. In this respect, "The net effect on GDP of war spending has probably been positive but is small and declining. An important impact of war spending has been to raise the nation's indebtedness." Mosafir asked about an Iranian role. Tanter said that for Washington to coordinate with Tehran would be like firemen asking arsonists why they set fires, when, and where to expect the next fire! Rather, Washington should help resettle from Iraq the main Iranian opposition that rejects clerical rule, the National Council of Resistance of Iran; some NCRI members are in Camp Liberty, Iraq held in prison-like conditions. Reaching out to the Iranian opposition might signal to the Arab Gulf States that Washington was taking the Iranian Shiite threat to the Sunni Arab world seriously. In addition to addressing the critique of host, Salam Mosafir, Tanter drew on some of the following Talking Points in discussing President Obama's search for a U.S. strategy.